Map of Franz Josef Land. 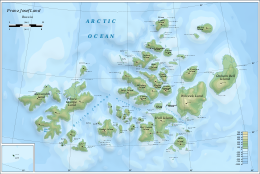 Franz Josef Land is an archipelago, north of Novaya Zemlya in the Arctic Ocean. It is part of Russia. It is administered from Archangelsk. It is made of 191 islands. Cape Fligely is the northernmost point of Eurasia. Getting to the island group is only possible during a few weeks in summer, in most summers. The northernmost point of Franz-Josef Land is only about 900 km from the North Pole - this means that the only places which are closer are Greenland, and Ellesmere Island in Canada. In the south, about 370 km of ocean separates the group from Novaya Zemlya. The group consists of about 191 islands. Roughly 80% of the islands are covered with ice all the time. The group has a volcanic origin. In 2007, there were two manned stations: Nagurskoye, a weather station, with 5 people, and observatory with 4 people. Victoria Island is 160 km west of the other islands, about half way to Svalbard. This page was last changed on 7 April 2017, at 08:46.